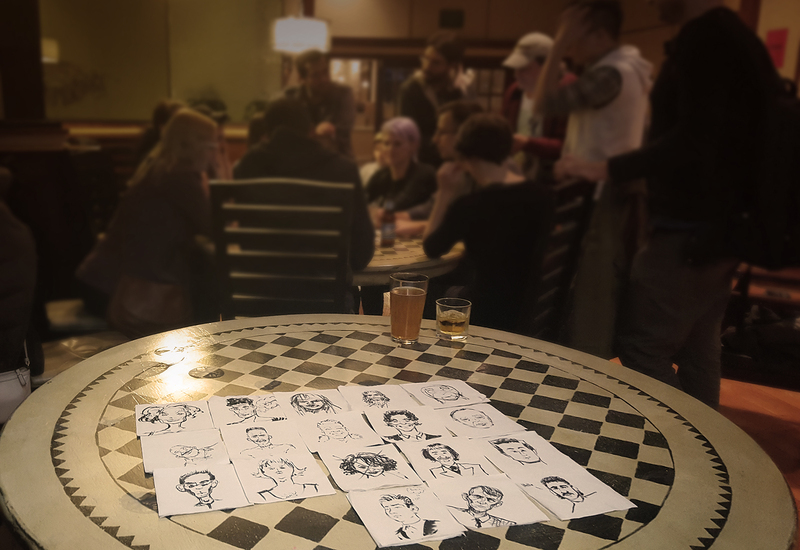 Last weekend, a bunch of Illustrators were hanging out at a bar in Allentown, PA. During our drunken revelry, we ended up inventing a new game we like to call 'Police Sketch Artist'. As a whole, the group decides on a famous and unique looking celebrity. Whatever artist amongst the group does NOT know who the celebrity is (by name) is tasked with drawing a picture of them using only descriptions given by his/her peers. Much like a Police Sketch Artist would have to do, hence the name. At first, it seemed like the challenge would lie in the abilities of the artist drawing the image. But we soon realized that the real difficulty came not in drawing, but in describing the person. Trying to identify what features truly captured the person's character was far more challenging than we initially thought. In the end we came up with some really great drawings that came surprisingly close! More times than not, the artist drawing the picture was shocked at the similarities when we showed them a real photo of the celebrity they had been drawing. I've included some of the best below. I could credit all of the artists and the celebrities, but I think it would be more fun to see what reader can identify them all. Give us your best shot in the comments section!